collection, which supports communities of men and religious nationwide in the care of their senior members. 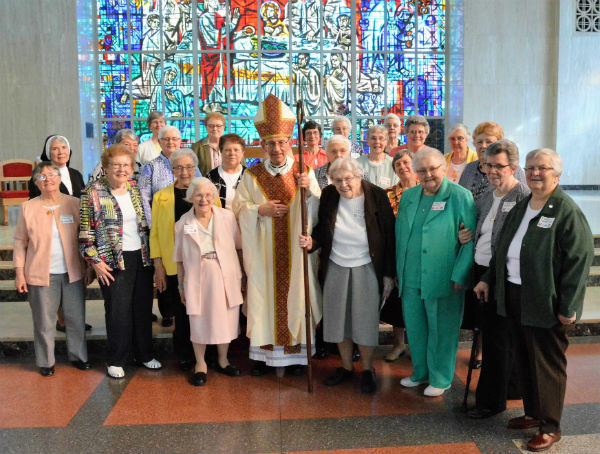 Parishioners in the 13 counties of the Diocese of Erie give generously every year to funds that support priest and religious retirement funds. Last December, people here gave nearly $200,000 to the Retirement Fund for Religious collection, which supports communities of men and religious nationwide in the care of their senior members. The National Religious Retirement Office in Washington, D.C., collected $25 million and then distributed that funding in 2018 among 360 religious communities, including those in the Diocese of Erie. According to Sister Nancy Fischer, SSJ, director for religious in the diocese, a total of $300,000 came back to Erie in 2018. This month’s Retirement Fund for Religious collection is scheduled for Dec. 8-9. “We appreciate the generosity of the people and we ask that they continue to support these elderly sisters,” Sister Nancy said. The Good Shepherd Collection, taken every spring, funds the priests’ retirement residence, provides revenue to the Priest Retirement Pension Plan, helps cover assisted living and longterm health care expenses, provides the bishop with funds for unexpected needs of incapacitated clergy and adds to the Clergy Health and Welfare Endowment. In 2018, parishioners gave more than $204,000 to the Good Shepherd Collection. According to Jim Bogniak of the diocesan Finance Office, Msgr. Daniel Magraw has been overseeing the priest collection for many years.